Rail stations across Scotland are set to benefit from a national investment programme that will deliver significant information and safety improvements to passenger facilities across the country, as well as cutting queues at stations. Transport Scotland is investing over £3.5m in a package of additional improvements at stations to enhance passengers’ rail experience across Scotland. Improvements delivered over the last year through the Small Rail Fund, benefitting two out three stations in Scotland, have been welcomed by passengers and this further investment will see upgrades at even more stations across the country. "This Scottish Government is committed to improving rail travel experiences and through these safety and information upgrades we are making a difference to the quality of service people experience when travelling on our rail network. "Following the improvements brought about by the Small Rail Fund last year, rail passengers will continue to benefit from our ongoing investment in their local stations". To improve safety four additional stations will have CCTV implemented, while 10 will receive new Customer Information Systems; nine will have station lighting upgraded and six interactive Customer Information Towers are being installed. An additional 25 Ticket Vending Machines are being installed to help cut queues at stations throughout Scotland. The Long Line Public Address (LLPA) system, which improves the efficiency of passenger announcements, is planned to be extended to a further 26 stations. This helps keep passengers better informed about services. "We work closely with Transport Scotland to deliver a range of facility enhancements, improving the overall journey experience for customers. In addition to our own investment programme, this funding has created opportunities for further improvements which rail users across Scotland will benefit from." The Minister for Transport has announced the next stage of delivering the landmark Glasgow Airport Rail Link (GARL) will be taken forward by Transport Scotland, the national transport agency. Stewart Stevenson has agreed the transfer of delivery powers to Transport Scotland. The agency’s main partners in the project – Strathclyde Partnership for Transport (SPT), Network Rail and Glasgow Airport Ltd – have agreed that this is an appropriate point in the programme to transfer responsibilities as the development stage has now been completed. As the current Authorised Undertaker, SPT has already successfully guided the project through the Scottish Parliament and carried out the crucial early stages of design development, land acquisition and advanced works. SPT will continue to support the project through the transition. In June last year, the Minister announced the decision to combine the project with the Paisley Corridor resignalling work (PCR), funded and delivered by Network Rail. This was to remove the potential for passenger disruption and increased cost had the two projects been delivered separately. "This represents the right way forward for GARL, a nationally significant project vital for the local and wider Scottish economy, especially in capturing the long term benefits which will flow from the Commonwealth Games in 2014. "The hard work SPT has put in to get us to this stage should not be underestimated and I thank them for successfully carrying out the initial phases of this crucial project. "As with all infrastructure projects funded from the public purse, the overriding objective must always be to deliver as effectively and as efficiently as possible. "We have already taken steps to achieve this by combining the GARL work with Network Rail’s signalling project and I am delighted the project partners have agreed this important next step. This will make best use of available expertise and ensure the project management is as robust as possible." "Getting the creation of a rail link to Glasgow Airport from a concept to the detailed design stage of an approved project, is a significant achievement. "It completes the essential first stages of a vision that SPT has had for a crucial airport rail link. It also fulfils our obligations under the GARL Act. "GARL is now ready to be built, so the time is right for Scotland’s national transport agency to take it forward through the implementation stage." "Our focus will continue to be on delivering the modernisation work required in the Paisley Corridor and enhancing the existing railway to accommodate the Glasgow Airport Rail Link on completion of the project. "The route requires considerable enhancements, including new track and signalling as well as a new platform at Glasgow Central station. "We look forward to our continued collaboration with Transport Scotland in delivering this vital new rail link for Glasgow and Scotland as a whole." "The airport rail link is one of the most important infrastructure projects of the new century and comes at a crucial time in the development of the city and wider region. We are grateful to SPT for the important role they have played in progressing this ambitious project. BAA is pleased to play its part in the delivery of this flagship development and looks forward to working with Transport Scotland and our other partners on the next phase of the rail link." The principal funding is from the Scottish Government through Transport Scotland, with additional contributions from Strathclyde Partnership for Transport, Glasgow Airport Limited and the European Union. Overall costs are currently being reviewed given that the scope of the new, combined project has changed but it is expected the change will produce efficiency savings overall through avoidance of duplicated work. The Glasgow Airport Rail Link will link the airport with Glasgow’s central business district and provide air travellers with direct access to the rail network. It will provide a high quality passenger experience from the moment that passengers exit the airport terminal building, via the link structure that Glasgow Airport Limited will build to connect their terminal building to the new airport station, to the moment that passengers arrive at Glasgow Central. It is estimated GARL will create 675 to 700 jobs in Paisley town centre within 3 to 4 years and 650 jobs in Glasgow and Renfrewshire with some £84 million in economic benefits created in Renfrewshire alone. The new third track will provide extra capacity to Inverclyde and Ayrshire and create an additional four trains per hour between Glasgow and Paisley. The main construction work on the existing railway and the new branchline structures is currently forecast to commence in early 2009. Banff & Buchan MSP Stewart Stevenson today welcomed the SNP Governments announcement that thirty-six science projects across Scotland are to receive funding through the Science Engagement scheme. Of the thirty-six science projects, eight will be based in and around the Banff and Buchan area. The small grants scheme will see a variety of projects receive a share of the £615,000 funding boost. Among the benefactors will be TechFest-SetPoint a registered charity that looks to promote science, technology, engineering and mathematics to schools and the wider community and which has previously been active in the Banff and Buchan area. "I am delighted to hear that many worthwhile projects will benefit from this allocation of small grant funds. It is important that community level projects which encourage children and their parents to take part in science activities receive adequate funding to continue their fantastic work. "In an increasingly competitive and global workplace it is essential that the people of Banff and Buchan keep ahead of the game in terms of scientific and technological expertise. Creating opportunities for our young people to actively engage in science projects in a fun and didactic manner can only encourage further interest and uptake in this important subject area. "The SNP is fully aware of the importance in encouraging the younger generation to pursue science subjects at school and we intend to introduce a Scottish science baccalaureate that will help us achieve this. We are confident the young people of Banff and Buchan will benefit from increased engagement with such an important subject and that this can stimulate further academic interest in the sciences. " The Stirling-Alloa-Kincardine rail link is on track to open on 19 May reintroducing passenger services to Alloa for the first time in nearly 40 years. Subject to final legal and safety approvals, full operations will commence after a period of driver training. The official opening ceremony will take place on Thursday 15 May with project promoter Clackmannanshire Council holding a celebratory fayre for the community on Saturday 17 May before passenger services begin on Monday 19 May. "I am delighted that the official opening of this railway will take place on 19 May. Last May, when I came into office, this project had many potential problems relating to cost and timescale. This Government vowed to deal with these issues and we have managed to ensure that this railway achieved best value for money and opened at the earliest opportunity to the benefit of commuters. "The project is one the largest of its kind undertaken in Scotland in recent years and it will bring substantial benefits both to residents of Clackmannanshire and businesses using the freight facilities. I would like to thank local residents for their patience and cooperation through the construction of the railway." It is expected the full commissioning of the railway will be completed by the 31 March. The Stirling-Alloa-Kincardine rail link is one of the most important railway infrastructure projects Scotland has seen in decades and has reopened approximately 13 miles (21km) of existing, disused and abandoned railway line between Stirling Station and Longannet Power Station in Kincardine. "The Council has pursued its dream of bringing rail back to the county for two decades and I am delighted that our dream will become a reality within a matter of weeks. I'm excited that the day I can jump on a train at Alloa, for business and pleasure, is nearly here. "In recent times Clackmannanshire has seen a tremendous resurgence in economic activity and this major development can only add to our regeneration, connecting people with jobs, education and new opportunities and opening Clackmannanshire up to the world. "The travelling public of Clackmannanshire will soon be offered a new choice on their doorstep that they’ve been denied for 40 years, which should also have a positive knock-on environmental impact." A new station has been built in Alloa allowing direct hourly passenger services between Alloa, Stirling and Glasgow Queen Street and onward services from Stirling to Edinburgh. Reconnecting the area to the rail network will open up education and employment opportunities for the residents with the increased accessibility encouraging inward investment and economic growth. The line will also provide a more efficient freight route to carry coal from the West of Scotland to Longannet Power Station and potentially provide freight services to other customers along the line. This new route will allow freight trains to be diverted from the existing, longer route via the Forth Bridge, and thus release capacity for improved passenger services. Banff & Buchan MSP Stewart Stevenson has slammed the legacy of the Labour and Liberal Democrats as new figures from a Parliamentary Answer revealed that student debt more than doubled between 1999 and 2007. The figures show that the average student debt upon entering repayment in 1999 was £2863. Yet by 2007, this figure had swelled to £5808. This also includes loans taken out to pay the Graduate Endowment, a Labour policy recently abolished by the SNP Government. "The disgraceful legacy of debt that the Labour led Executive has had on Scotland is one that has not been lost on the student population. When Labour first came to power in 1997 the mantra was 'education, education, education' however through their introduction of The Graduation Endowment they created a back-door tuition fee that made Further Education even less accessible to vast swathes of the population. "The SNP Governments key priority is to make education accessible to all and our scrapping of The Graduation Endowment will make strides towards reversing the Labour legacy of mounting student debt therefore making further education more attractive to our constituents. "It is of fundamental importance that we address the skills gap in many industries by making Further Education more attractive. I was recently pleased to launch the 'Nautical - the Next Step,' a course being offered by Banff and Buchan College that is looking to bridge this skills gap in the maritime industry and harness a strong tradition of seafaring. "By reducing the financial burden on students we can ensure our local colleges are able to increase their up take of students to courses such as those mentioned so that Banff and Buchan’s up and coming generation are given every opportunity to attain the skills and qualifications needed to develop successful careers." Banff and Buchan MSP Stewart Stevenson today condemned the Labour Politicians who voted against bringing a halt to the Post Office Reform Programme and to look again at support for post offices or alternatives such as community or council ownership. While there was cross party support with SNP, Tory, and Lib Dem MPs voting to suspend the closures alongside 19 English Labour rebels, the motion failed by 20 votes. Of particular note was the failure of any Scottish Labour MPs to vote to stop the closures. The Post Office, as part of their Network Change Programme, has announced plans to close over 250 local Post Offices in Scotland by 2009. "Post Offices provide vital services for local communities in particular for pensioners and for those living in more remote rural areas. The SNP Government believes that a strong vibrant post office network is fundamental in the provision of many important services and one which plays a crucial role in supporting small businesses. "We do not believe that the 250 planned closures are necessary and that these offices should be forced to shut as a result of meddling by the UK Government is both illogical and contrary to public opinion. "The threat of Post Office closures in Banff and Buchan will act as another slap in the face to my constituents from the UK Labour Government. I call on the Labour MP’s from the surrounding area in particular Frank Doran MP, Anne Begg MP and Jim McGovern MP to clarify why they voted against halting the Post Office Reform Programme. "Sadly the provision of postal services is reserved for Westminster under the current terms of the devolution settlement ensuring the SNP Government’s hands are tied on this issue. Coming off the back of the massive hike on whisky duties we see twice in the space of a week decisions being taken by the Westminster Labour Government that harms the Interests of the people of Banff and Buchan and ignores Scottish sentiment. For too long we have seen the Labour MP’s from Scotland submissively toeing the party line to the detriment of our national interest." Stewart Stevenson likes to illustrate his green credentials with a driving tip. He has recently reduced the cruise control setting on his car by 5mph. The result: on the relatively rare occasions when he drives from his constituency to the Scottish Parliament, his fuel consumption is 10 per cent lower than before. When it comes to his ministerial portfolio, however, Stevenson cannot afford to cruise. As the first Scottish minister to combine responsibilities for transport and climate change, he must steer a fine course: strengthening the nation’s communications links, while squeezing emissions. Banff and Buchan MSP Stewart Stevenson today applauded the "Eating for Scotland" campaign being carried out by the STV programme "The Five Thirty Show". As part of the television show’s campaign, the show’s presenter has pledged to only eating food produced in Scotland from Burns Day until St Andrews Day. This week First Minister Alex Salmond will join the presenter by also beginning a week-long commitment to only 'eat Scottish' food in support of what is a fantastic campaign for the Scottish agricultural industry. "I applaud the work being carried out by STV in giving due recognition to the Scottish Farming Industry. The high standing of Scottish produce is renowned on the continent for the quality of the farming and cattle rearing techniques employed here. "This privileged culinary environment we find ourselves in is often overlooked by ordinary Scots and is not helped by the role of large supermarket chains in buying cheaper less quality products from abroad. There is however a wind of change as Scottish consumers realise the quality on our doorsteps and begin to think about the impact of ‘food miles’ on the environment. "We in Banff and Buchan are well aware of the high quality and value of the local food industry to our region, from the primary production level of fishing and farming, to the food- processing sector, right through to the catering and service industry. "While we in the North East still have a close connection with the local farming industry, the promotion of Scottish Produce in the media throughout Scotland will act as a much needed reminder of the wealth of high quality goods available. "The SNP Government is keen to encourage more support for our own produce and increased national media attention is an important means of making the rest of Scotland aware of what the Banff and Buchan farming industry has to offer." It is a vision that many aspire to in the search for the ideal neighbourhood - tree-lined streets, congestion free roads, and pedestrianised zones clear of cars and pollution. That vision could soon become a reality under new plans unveiled by the Scottish Government and the Convention of Scottish Local Authorities today. Transport Minister Stewart Stevenson is making up to £15 million available over the next three years and calling for expressions of interest on a matched funding basis from Scotland's local authorities to help create a series of 'sustainable travel demonstration communities' across the country. The communities would be a role model for others to follow, showcasing the very best methods available to encourage residents to use more environmentally-friendly forms of transport. Similar schemes elsewhere have already led to impressive results. In Darlington, there has been a 14 per cent increase in public transport trips, 29 per cent increase in walking, 79 per cent increase in cycling and car journeys down by 11 per cent. The results have been achieved through simple measures such as improving cycle and walking routes, better public transport links, more pedestrian-only areas, travel advisors visiting homes providing tailored travel plans, car sharing schemes and discounts on bus and train tickets. Today's announcement coincides with a visit by the UK Climate Change Committee to Scotland. "Congested roads, increasing car use, more cars on our roads, and rising emissions - these are the worrying trends facing Scotland in 2008. "It is clear that it is time for us all to take action. We must encourage a change in the mode of transport we use. "We need to look at new ways of persuading people out of the car and onto more sustainable forms of travel such as trains, buses, walking and cycling. "Sustainable travel communities give us a fantastic opportunity to do just that, and could drastically change our travel habits. This approach has delivered impressive results in other countries, transforming the travel behaviour of thousands of residents. "I want to see Scotland do even better. "This is an opportunity for forward thinking towns to deliver lifelong changes in how its citizens go about their daily business. "The effects of this policy could be felt across all walks of life delivering a more vibrant Scottish economy, a less congested roads network, a cleaner environment, and a much healthier nation. "We have made substantial funding available for this project, and I hope local authorities across Scotland take up the challenge and apply to take part. It could deliver real improvements in traffic levels, emissions, and the health of residents across the country." "I am excited about this project. Councils have long been advocating sustainable travel through their work on the provision of cycling and access routes as well as the promotion of public transport and the use of greener fuels. We all want to live in more sustainable, healthier communities but getting from where we are now to there is going to involve some fundamental lifestyle shifts. "This project provides a forum for looking at how we can make these shifts in a big way. This has to be a concerted effort, and if we can demonstrate that these approaches will work in Scotland as they have in Darlington we can start the journey of bringing others on board to provide leadership at the highest level in making the big changes necessary to achieve sustainable places in communities all across Scotland." There are currently three 'sustainable travel demonstration towns' running in England - Darlington, Peterborough and Worcester. Banff and Buchan MSP Stewart Stevenson has welcomed the announcement of record capital funding for NHS Grampian. Figures revealed by the Scottish Government show that the budget for capital spending on equipment, and facilities for the health board will be £29.33 million in 2008/09, with funding of £29.78 million and £30.24 million provisionally allocated for 2009/10 and 2010/11 respectively. This funding will also allow work to start on a new Emergency Care Centre for Aberdeen. The announcement by Cabinet Secretary for Health, Nicola Sturgeon amounts to £525 million across Scotland in 2008/09 for new and upgraded health facilities, and specific projects in areas such as e-health, primary care and primary and community care premises. The total investment over the three-year period is £1.6 billion pounds. Also included is a £25 million funding boost for the Scottish Ambulance Service which will be used to buy new ambulances and defibrillators. "This funding will allow NHS Grampian to continue its building programmes and to start work on a new Emergency Care Centre for Aberdeen. This is great news for Aberdeen and the surrounding areas and will ensure that we have a health service infrastructure in the North East that is fit for the 21st Century. "Improving the provision of Health Services in Scotland is a key priority of The SNP Government and one which is reflected by the record amounts we have allocated to NHS Grampian. The benefits of improved capital investment packages such as these will be felt by patients and staff across Banff & Buchan. "People in Banff & Buchan can look forward to investment in hospitals and NHS facilities across the region. "The money allocated to NHS Grampian is expected to rise over the next three years, which is more good news from the SNP Government for the people of Banff & Buchan." Banff & Buchan MSP Stewart Stevenson has welcomed funding of £3.24 million allocated to rural communities in Aberdeenshire to grow local economies, improve rural facilities and conserve the environment. £57.7 million is being made available to communities across rural Scotland, jointly by the Scottish Government and the European Union under the LEADER programme. This funding will be matched at a local level by public and private funds, potentially doubling the figure. This is the first share of money to be released under the £1.6 billion Scotland Rural Development Programme, designed to empower communities at the grass roots level. “I am delighted to see this massive investment in rural Aberdeenshire communities. This is a democratic funding programme which will see decisions on how best to drive community development being taken in local areas. “This will empower community decision-making and ensure that only grassroots projects that will make a real difference to rural Aberdeenshire are selected. “Representing the most rural constituency in mainland Scotland, I appreciate how important it is to preserve and support our rural communities in the North East. This funding is just the kind of boost these communities in Banff Buchan need. Banff & Buchan MSP Stewart Stevenson has welcomed the news that police numbers in the Grampian Police Force area are steadily increasing with the latest boost due to the SNP's commitment to increase police numbers. Grampian Police has announced that police numbers have gone above 1500 for the first time. The SNP Government's funding for additional officers and the ongoing Grampian Police recruitment programme are expected to push that number over 1600 next year and over 1650 by 2011. "This is excellent news for the people of Banff & Buchan and a moral boost for police forces throughout the area. Residents can be assured that these extra officers will act as a significant boost to policing in the region. "From the outset, the SNP has been committed to delivering a more visible police presence on our streets, where it matters most.. The SNP Government is acting on its manifesto pledge to dramatically increase the number of police officers on duty in our communities and I am delighted that Grampian will be an area that sees some early benefit from that programme of recruitment. "Having more police officers on the street is fundamental to achieving our goal of creating a more effective police force to tackle criminal activity and to enhance public safety in communities across Scotland. The recruitment of these extra officers is one that will also provide additional high quality employment and career prospects for young people in Banff & Buchan interested in making a difference to their communities." Minister for Transport, Infrastructure and Climate Change, Stewart Stevenson today announced the appointment of a new member to the British Waterways Board. The new Board member is Dr Jon Hargreaves, recently retired from the post of Chief Executive of Scottish Water. Dr Hargreaves does not currently hold any other Ministerial public appointments. This appointment will be for three years and will run from April 1, 2008 to March 31, 2011. The time commitment for the Board is between two and four days a month to be agreed with the Chairman of the Board. This post is part-time and attracts remuneration of £12,712 per annum, with an additional annual fee of £1,000 payable for service on the British Waterways Scotland Group, plus an additional £1,500 if selected as Chair of this Group. If appointed to serve on any of the other committees (Remuneration, Pensions, Fair Trading, Audit, Property) this would also attract additional fees at these rates. British Waterways is a cross border public corporation which runs its affairs on a commercial basis consistent with its statutory powers and its objectives agreed by the Government. It promotes the use of its waterways for leisure, recreation, tourism, regeneration and transport while also conserving the waterways' natural and built heritage. Two members of the Board are appointed by Scottish Ministers. Dr Hargreaves replaces Campbell Christie who has served on the British Waterways Board for a almost ten years. Members of the board are drawn from, but do not represent, a wide range of relevant interests. They are selected on the basis of their stature, background and breadth of experience which will enable them to make wide-ranging, direct and relevant contributions to the Management of British Waterways. They oversee all aspects of British Waterways' organisation and performance. Their role is to give strategic direction and to monitor the Board's execution of its duties. Day to day responsibility for British Waterways' activities lies with the executive staff who are responsible to the Board. The staff are headed by a Chief Executive, who is appointed by, but is not a member of the Board. This Ministerial public appointment was made in accordance with the Commissioner for Public Appointments Code of Practice. All appointments are made on merit and political activity plays no part in the selection process. However, in accordance with the original Nolan recommendations, there is a requirement for appointees' political activity (if there is any to be declared) to be made public. Mr Hargreaves has not declared any political activity. spirits duty of 59 pence – equivalent to a 9% duty rise. industries both in export, earnings and employment terms. to clobber one of Scotland’s premier products. economies and acts as an emblem for Scotland the world over. whisky industry or tackle binge drinking. 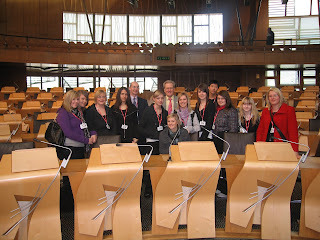 Banff & Buchan MSP Stewart Stevenson yesterday (Thursday) hosted a visit to the Scottish Parliament from Peterhead Academy students. The S4 and S5 Modern Studies students, accompanied by teachers Gordon West and Jacqueline Ives, received a tour of the Parliament, attended the Chamber for First Minister’s Question Time and met with Mr. Stevenson and SNP North East MSP and Schools Minister Maureen Watt. “I am delighted to have had the chance to welcome Peterhead Academy to the Parliament and to meet with local pupils from my constituency. It is an excellent idea for students to visit the Scottish Parliament, meet with MSPs and witness at first hand how the Scottish political system works. “I took the opportunity to explain some of the procedures of Parliament to the group and describe the average working day of an MSP and indeed a Minister. The visit seemed to be both a learning and fun experience for the students. The next section of the A9 to be considered for dualling is being investigated by Transport Scotland. The national transport agency has been asked by Transport Minister Stewart Stevenson to take forward the next stages of feasibility work for the dualling of the 18 miles of the A9 between Perth and Pitlochry. The first stage of this design work focuses on the stretch of road between Luncarty and Pass of Birnam. This work will inform the Strategic Transport Projects Review (STPR) which is due to report in Summer 2008. "The A9 is crucial to economic development in the north of Scotland. We made the commitment to plan for dualling the A9 when we came into office and today's announcement is a major step forward in that process. "I asked Transport Scotland to identify the next possible stretch of the A9 to be dualled and these designs will now look at ways to widen the carriageway, close the central reservation gaps and introduce grade separated junctions. "By undertaking the design work between Luncarty and Birnam, the potential project can be assessed in the STPR for funding with a robust basis for consideration." Transport Scotland is the national transport agency responsible for road, rail and national concessionary travel. Transport Scotland is an executive agency directly accountable to Scottish Ministers and was established on January 1, 2006. Transport Scotland recently appointed Atkins as their design consultant and site surveys will be undertaken during the first part of this year to gather environmental and traffic information with the overall study due to complete in the Autumn. ensuring care is better, quicker, safer and closer to home. Services which led a comprehensive review of these services. Commenting on the continuation of services in Aberdeen, Mr.
Dem administration who initiated this review. Buchan – and as close to their homes as possible." that the needs of the North East were heard loud and clear. Sturgeon has reaffirmed this position. that services will be staying local." The construction of the M74 Completion project is now only a few weeks away after the contract to build it was officially awarded. Transport Scotland’s agent for the scheme Glasgow City Council has formally let the £445m construction contract to Interlink M74 Joint Venture. Work will begin in May on the project which will significantly reduce congestion on the busiest stretch of the M8 through Glasgow and provide a major economic boost to the west of Scotland. "This Government is committed to completing the M74 and I am delighted to see the tendering process reach its conclusion with the award of this contract. "This extension will complete an important link in Scotland’s motorway network and reduce congestion on the busy M8 through Glasgow, providing links to regeneration projects in the city’s east end and bringing much-needed new investment to help capture long term benefits from the Commonwealth Games in 2014." The project, funded by Transport Scotland with contributions from Glasgow City Council, South Lanarkshire Council and Renfrewshire Council, will grow Scotland's economy by improving transport links in the west of Scotland and bring new jobs, particularly along the route but also across the west of Scotland. "This is another vital step along the way in the regeneration of Glasgow. The completion of the M74 will bring jobs to Glasgow, reduce congestion and lessen journey times for commuters, and mean that the city's transport infrastructure will be ready for the 2014 Commonwealth Games." "The M74 completion is vital to the ambitious regeneration plans we have for South Lanarkshire and it is great to see the project moving forward. Modern and sustainable transport links are vital to the economy and we are proud to be part of something which will create jobs and reduce congestion on our roads." "We welcome this progress on a major project which will boost the continuing regeneration of Renfrewshire by allowing goods and services to be transported more quickly and reliably. Our business community will see a reduction in transport times and this investment will also improve the competitive position of Glasgow Airport. This is good news for Renfrewshire and good news for the regional and national economy." Work will start on the project in early May, with construction expected to last three years. The Borders Rail Project, which will strengthen some of Scotland's poorest rural communities and provide sustainable, integrated and cost effective public transport infrastructure, was given the go ahead today. Transport Minister Stewart Stevenson updated Parliament on the due diligence exercise that Transport Scotland had carried out on the project and to set out the way forward. "The Scottish Government has always been clear that this project must deliver value for money. That is why I stated in June that our continued support for this project would only be possible if the project met three funding conditions set by the previous administration. "Now that Transport Scotland has completed the due diligence exercise I am happy to announce today that we expect the project to be delivered in 2013 at a cost of between £235-£295 million. I can also announce that a decision has been made to take forward this procurement using a non-profit distributing vehicle. "The use of NPD models for railways is already well established - for example the financial structure of Network Rail. The details of our final approach will be developed by Transport Scotland in conjunction with the Financial Partnerships Unit and Partnerships UK, having taken full account of market soundings and the need for a competitive procurement process. "There are many benefits to this project and at its heart is the need to build a dynamic and growing economy that provides prosperity and opportunities for all. The project will also provide for a full range of housing options to the Borders and surrounding regions. "The railway will also provide a sustainable, integrated and cost effective public transport alternative to the car, connecting people, places and businesses across the Scottish Borders, Midlothian and into Edinburgh. It is estimated that 450,000 tonnes of carbon will be saved over a 60 year period by constructing this railway. "I believe that this project will bring real benefits to the Scottish Borders communities and I am delighted to outline the plans for the successful delivery of this railway." There will be stations at Shawfair, Eskbank, Newtongrange and Gorebridge(Midlothian), Stow, Galashiels and Tweedbank (Scottish Borders). There will be half hourly services with a 55 minute journey time from the centre of Edinburgh to Tweedbank. The project received Royal Assent on July 24, 2006. Since the Act was passed, a number of key items of work have been progressed by the Waverley Rail Partnership, including: Ground Investigation works, Topographical survey works and land acquisition. Work on the outline design also commenced in October 2007. Banff & Buchan MSP and Water Minister, Stewart Stevenson has announced that a ‘guaranteed minimum service’ should be set for water customers and when this service fails customers should receive a rebate on their water bills. Mr. Stevenson also announced that new corporate arrangements for Scottish Water would be put in place whereby Scottish Ministers will set the objectives and outcomes for the public body to deliver. “This is very welcome news for small businesses and indeed all water customers in Banff & Buchan. What this would effectively mean would be that customers would be guaranteed an efficient and fit for purpose water service, failing which they would receive a rebate. “Following recent problems with Scottish Water experienced by businesses in Peterhead where they received incorrect meter readings and were significantly overcharged, this is a major step in the right direction. “I was heavily involved in highlighting these injustices in Peterhead and campaigning for a more efficient water service for my constituents. And now as the Minister in charge of the water industry I have used the bad experiences of customers locally to shape quality assurances for water customers in Scotland. Householders wishing to install energy generating equipment, including solar panels, will no longer require planning permission under proposals announced today. A consultation has been launched on planning reforms aimed at increasing renewable energy generation and cutting emissions. Most householders currently wishing to install solar panels, heat pumps or wind turbines on existing buildings must apply to the local planning authority for consent. However, under the proposals, permission may be granted automatically under Permitted Development rights, provided that strict criteria are met. "We recently announced our intention to introduce a statutory target to reduce Scottish emissions by 80 per cent by 2050, as part of our proposals for Scotland's first Climate Change Bill. "Everyone has a part to play and the Scottish Government is providing strong leadership by reforming the planning system to encourage greater use of microgeneration equipment. This signals Scotland's serious intent to lead the global effort to tackle climate change. "The cost and time required to get planning consent can often be a disincentive to householders seeking to install microgeneration technologies. "We are seeking to strike the right balance between planning considerations and the wider environmental benefits of reducing carbon emissions. "Low carbon technologies in our renewable energy mix, including microgeneration and combined heat and power, will make a significant contribution to Scotland's future prosperity and help build increased, sustainable economic growth." Mr Stevenson launched the consultation at the home of Edinburgh resident Dora Elliot, who required planning consent to install Solar PV (photovoltaic) on her own home. Solar PV uses energy from the sun to create electricity to run appliances and lighting. Mrs Elliot has since reduced her electricity consumption by around 50 per cent. On average, installation of Solar PV can save householders around £170 each year. "The Energy Saving Trust supports the installation of microrenewables and would welcome a relaxation of the planning regulations to make it easier for householders to install microrenewables and thereby help people to do their bit to reduce their own carbon footprint." The consultation runs for 10 weeks. A permitted development (PD) is one where planning permission is granted as a right and there is no need to apply to the planning authority for consent. Where PD does not apply, applicants would have to seek planning consent under the normal procedures. The consultation proposes that solar panels on normal domestic buildings would be allowed under PD if it was installed on a pitched roof or a wall, covered up to 60 per cent of the area and protruded less than 150mm above the roof/wall. PD would not apply to the walls of buildings containing flats. PD would apply to flat roofs if less than 1m high, covering less than 60 per cent of the roof and set back 1m from the roof edge. Additional safeguards would apply in conservation areas or world heritage sites where they would not be PD on a principal elevation fronting a road. Stand-alone solar panels would be permitted if less than 4m in height, at least 5m to any boundary and a maximum area of 9m square. They would not be permitted within the curtilage of listed buildings. Additional safeguards would apply in conservation areas or world heritage sites where they would not be PD if facing onto or be visible from a road. Ground source heat pumps and water source heat pumps would be permitted in all areas. Wind turbines on domestic buildings would not be permitted in conservation areas or world heritage sites. Elsewhere they would not be permitted under PD if more than 3m above the top of the roof and with a blade length of 1.2 metres. The consultation also seeks views on what distance criteria should be set to safeguard near-by property against noise, proposing 100m as a basis for consultation. Free standing turbines would be similarly limited, with overall height limited to 11.1 metres and at least 12 metres from the boundary. Flues for bio mass boilers/stoves would be permitted development except in a conservation area or world heritage site if they were visible from a road. The Scottish Community and Householder Renewables Initiative was launched in 2003. It provides advice, grants and support to those wishing to install microrenewable technologies such as solar power, heat pumps, biomass, micro wind and micro hydro. More than 2,000 grants have been awarded to householders since the scheme was launched. The most popular technologies are those used to provide heat. More information is available from the Energy Saving Trust website.